The type of media consumers prefer has evolved quite rapidly with the advent of the Internet and mobile devices. Having insight into how consumers behave, especially how they use different channels to discover, purchase and get service, plays a big role in how marketers target customer experiences, as well as how they develop marketing plans. Today’s modern consumer interacts with multiple media every day so targeting that media by marketing goal, acquisition, awareness or cross-selling is important to make the most of limited marketing budgets. Mobile phones have not only become commonplace, but are also increasingly capable of rivaling other media in the ability to serve up targeted advertising. 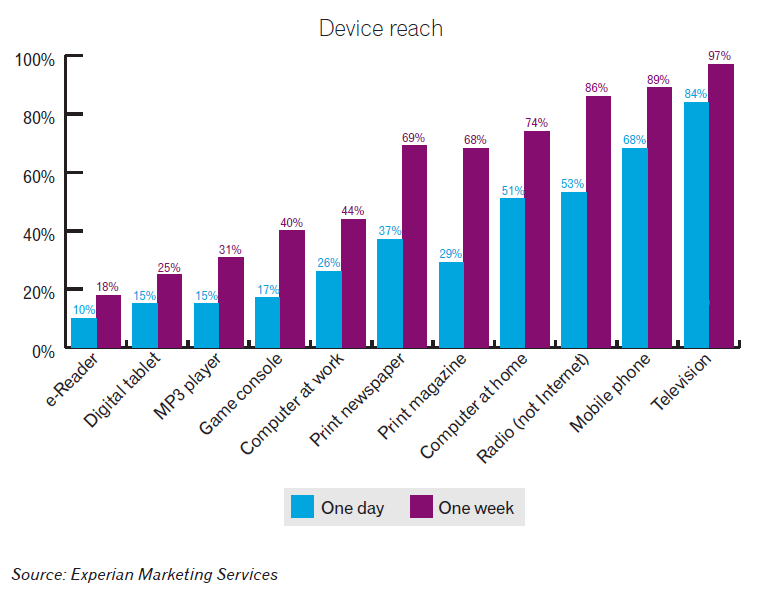 According to findings published in The 2014 Digital Marketer: Benchmark and Trend Report, 69 percent of U.S. adults today use a mobile phone during a typical day and 89 percent use one during a typical week — that doesn’t even include the millions of adults who use other mobile devices such as digital tablets and e-readers. By comparison, 84 percent of adults watch television in a typical day and 97 percent in a typical week. 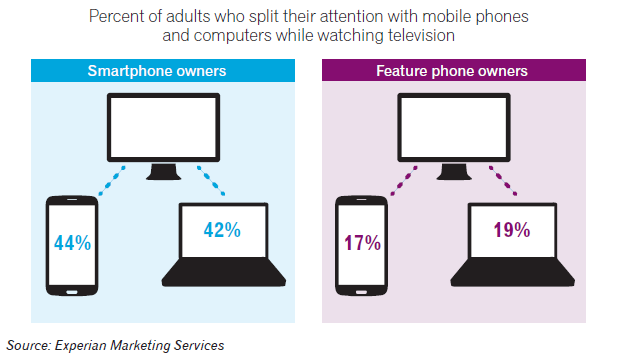 Among affluent adults, the reach gap between television and mobile phone is even narrower. During a typical day, 80 percent of adults with household incomes of $100,000 or more use a mobile phone and 87 percent watch television. In an average week, 96 percent of affluent adults use a mobile phone and 98 percent watch television. It’s only a matter of time before mobile usage reaches parity with television, and by then marketers will have even more ways to precisely target and engage consumers through their phones. Mobile still has a long way to go before it can compete with television for time spent, however. 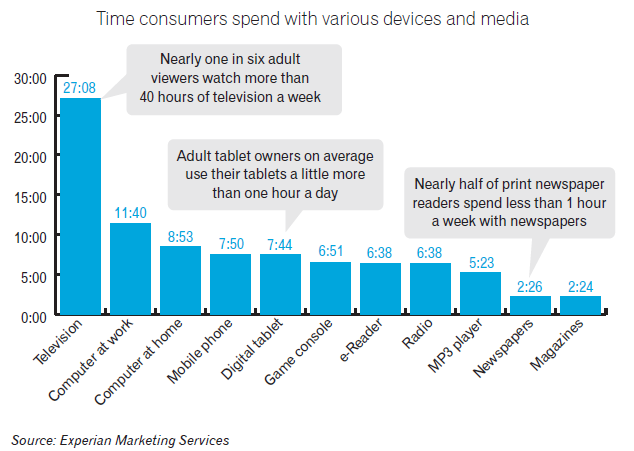 Consumers now spend just over an hour a day using their mobile phones, or seven hours and 50 minutes a week, but they spend more than three times that watching television. In fact, nearly one-in-six adults watch more than 40 hours of television in a typical week. Consumers may be spending the most time watching television, but the household’s largest screen is increasingly competing with smaller screens for attention. Thirty-one percent of adults say that they often use their mobile phone or computer while watching television to engage in common activities like visiting Websites, watching video, emailing, texting or IMing. Smartphone owners are the most common multi-taskers, with 44 percent saying they often use their smartphone while watching television versus just 17 percent of feature phone owners. Smartphone owners are also more likely to be distracted by a computer when watching television. Furthermore, research published in our latest Cross-Device Video Analysis reveals that mobile is the first screen for consuming streaming or downloaded video content with 24 percent of all adults and 42 percent of smartphone owners viewing video on their phone during a typical week. Young and older adults alike are most likely to be watching video on their smartphone between the hours of 8:00 and 9:00 PM just when primetime television is kicking off. 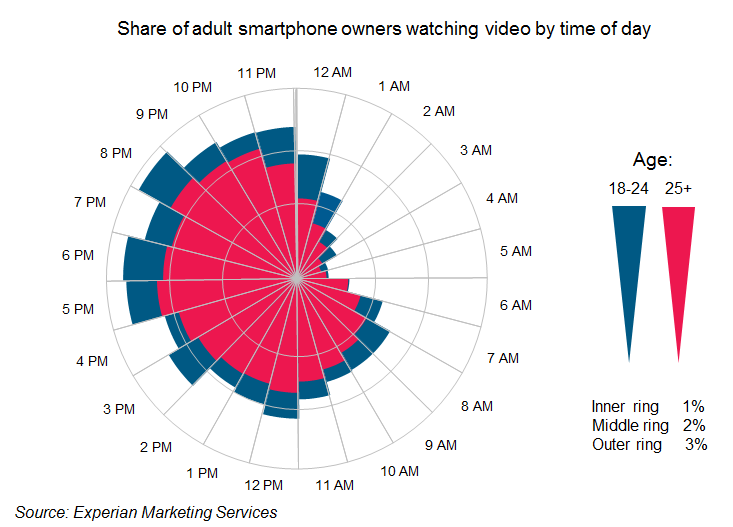 Throughout the day and night, young adults, those ages 18 to 25, are more likely than those age 25 and older to be watching smartphone video, with the biggest gap occurring during the overnight hours. When older folks are recharging both their bodies and their devices, the young barely power down. For additional insights into cross-platform media consumption, download The 2014 Digital Marketer: Benchmark and Trend Report and for an in-depth focus on trends in online video viewing, download the Cross-Device Video Analysis.